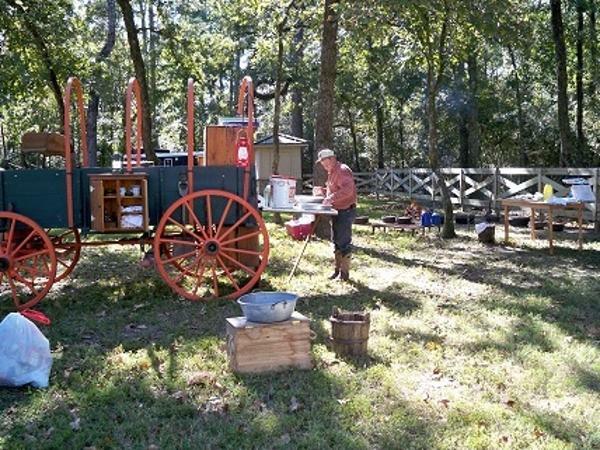 Chuck wagon cooking isn’t fancy, but once you’ve had the real thing you don’t forget it. The meat recipes that I have chosen for this month reflect the simple pleasures of Texas cowboy and ranch life. They’re not fancy; they’re just good home cooking: real chuck. All of this months’ recipes were probably cooked on the wagon and can be cooked in a Dutch oven. This months recipes range from frying steak to something that might take a few hours, but they’re all worth trying. Most are standard ranch or chuck wagon fare, but many are just as appropriate on a white linen tablecloth - and of course, some are not. Remember, on the chuck wagon, the heat source was wood, and the food was cooked in a Dutch oven. Mainly beef but other types of meat dishes were cooked on occasion. Pork, chicken, and fish were all cooked at times. There was a never ending supply of beef so any change in meat was considered a special occasion. The chuck wagon cook might catch fish from a river or trade with farmers along the way for pork or poultry, but most of the time the menu was beef. Grilling was unheard of back then and everything that could be sliced and pounded was fried done in a Dutch oven. When a steer was butchered that was a lot of meat but not much of it was steak. Tough cuts require longer cooking, which is why chili’s, stews, and braised meats were always the most common dishes in chuck wagon cooking. Besides, simmering a one-pot meal over a low fire is a pretty foolproof way to cook and the Dutch oven made that style of cooking possible. Try one or all of this months recipes and you can pick your favorite. Prepare the flour spice by blending the flour, salt, and pepper. Prepare the batter by mixing the eggs, milk, sourdough starter, and beer. Whisk to blend. Set aside. In a Dutch oven heat oil. While the oil is heating, prepare the round steaks by dredging them in flour spice, taking care to evenly coat meat. Dip the meat into the batter and then again in the flour spice. When the oil reaches 350°temperature (when a drop of batter sizzles when dropped in it). Cook the steaks about 5 minutes on each side or until the batter is nicely browned. Drain the cooked steaks on paper towels. Pour black pepper gravy over steaks and serve. Melt butter in Dutch oven Whisk in flour until cooked and brown. Slowly add milk stirring to keep lumps from forming. Season with salt and pepper. Simmer gravy for 10 minutes to cook and reduce. Serve hot. Make a rub by combining all the dry ingredients. Season the raw brisket on both sides with the rub. Place in a Dutch oven and roast over medium heat for 1 hour. Coals only under bottom of oven. Add beef broth and enough water to yield ½ inch of liquid in bottom of oven. Continue cooking for 3 hours, or until fork tender. Trim the meat and slice across the grain. Top with juice from pan. Serves about ten. Conventional oven 350°. Place 14” Dutch oven over coals and cook bacon slices until transparent. Store bacon for later use. Cut tenderloin lengthwise in two different slits to within ½ inch of each end and bottom. Place frozen or thawed crab, end to end, inside tenderloin slits. Melt 1 Tbs butter with lemon juice and drizzle over crab. Fold top side of tenderloin over crab. Tie tenderloin securely with heavy string at 2-inch intervals. Sprinkle outside of tenderloin evenly with garlic salt and pepper; place in Dutch oven. Cook with coals on top and bottom of Dutch oven with a moderately high heat, 40 to 60 minutes. While meat is cooking, sauté green onions in butter. Add white grape juice and garlic salt. Cut bell peppers in half crosswise. Remove seeds. Pour equal amounts of butter in pepper halves. After meat is cooked, arrange bacon crosswise on top of tenderloin. Put coals on lid of Dutch oven and cook for 5 minutes until bacon is crisp. For garnish, place pepper halves containing butter sauce on each side of tenderloin. Remove string, slice, and serve. Yields 8 to 10 servings. For conventional oven cook at 375°. Brown pork chops on both sides in small amount of oil. Mix other ingredients in pan and heat. Pour over chops in Dutch oven. Cook with coals under bottom of oven for 2 hours or until tender. Combine flour, parmesan cheese, and seasonings in bowl. Combine milk and egg in another bowl. Dip chicken in milk/egg mixture, then coat with flour mixture. Place in buttered 14” Dutch oven. Drizzle additional butter over chicken. Bake over moderate hot coals for 1 hour, or until tender. For conventional oven bake at 400° for 45 minutes. Heat 3 tablespoons oil in Dutch oven over medium heat. Add the catfish, peppers, onion, and garlic. Sauté until the vegetables are wilted and the fish is cooked through, about 5 minutes. In a large bowl combine the fish, mayonnaise, cilantro, mustard, crumbs, egg, lemon juice, salt, and pepper. Form the mixed ingredients into 10, three ounce patties. Pack the mixture tight so it will stay together while cooking. Set aside on a plate. Heat 1 ½ cups oil in Dutch oven until smoking slightly. Dust each fish cake with flour and gently slip it into the hot oil. Fry the cakes for 2 minutes on each side, or until golden brown. Remove the cakes and drain them on a paper towel lined pan. Serve hot. Try one or all of these recipes and see which is your favorite. Until next time! Mike Atchley is a professional and competitive cowboy cook and is the owner of The Chuck Wagon Cafe in Moscow, TX. If you would like to Comment on The Chuck Wagon, we'd love to hear from you. Your name and your comment will be posted in Letters to the Editor.